The first thing that Guy said after I gave Guy his new Blankie this morning was thank you and I love you so much!! Then after we christened Blankie with an inaugural snuggle Guy said, "I'm going to go downstairs and play with Blankie. And we're going to do all the things that Blankie likes to do...like maybe play soldiers...and Blankie can be the monster." And games of chase...Wow, the magic really is back. We are all so happy and relieved. It took me 60 hours of knitting to replace Blankie. It took the coordination of my hands and all of the love in my heart to finish. It took learning lessons and applying the Atonement. It provided me priceless opportunities to teach my children what is right and what is good and what is important and how to forgive and to always think of others and how important it is to say "I am sorry," even when it hurts, because that is what Jesus asks of us. We did it, and I'm glad we did. I am thankful to receive through this experience the education that I cam here to acquire. It makes me so happy to see Guy and Blankie back together again. And now, there is only peace and wisdom and gratitude to my Heavenly Father and to our Savior Jesus Christ for now I understand more personally the burden that he carries for us. The burden that he has helped me to bear. it even looks better this time around. plus guy will now know how to not leave it anywhere but in your own home. You are such a good mom! I'm so glad he loves it! Just one more thing I HAVE to say...I think the picture of Guy with his new blankie will be a family heirloom. A face full of pure bliss. Thanks for sharing this story. I am sure that if you do make it for your grandkids, they will love it all the more because of the lessons that their parents will share. Their Grandma will be an example and a teacher. What a blessing to learn lessons from our Father in Heaven, but what a greater blessing to RECOGNIZE those lessons! You are such a wonderful example. Tarin wrote "Oh Jocelyn! This made me cry! I'm so happy Guy has you for a mommy! I am also so glad you are my friend so I can be uplifted by what uplifts you :) I felt a stirring when I saw the instruction book you included with the pictures...just like how we have an instruction Book on how to rebuild/knit/heal what was lost/broken/torn apart to make it beautiful, lovely,magical...and finally be in a better place :)"
Thanks to each of you for going through this experience with me! I think you could make a children's story about the blanket...to teach values to everyone...beautiful blanket. 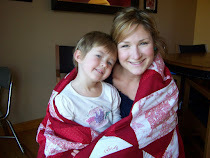 What a lovely blanket and a very happy child. I loved the pictures. I love to crochet; the pattern looks like a great one. I enjoyed all of your thoughts today. You are such and loving Mother, Guy will remember this forever! hey...Lin is right. This does need to become a child's story book. You might have a bestseller on your hands. You could do it. then market it...and have M2 or D help with some illustrations altho usually some book printers have their own illustrators. Oh what a great idea. Love the picture of Guy with his blanket. So great! And way to go finishing it! Thanks for letting us learn with you! Wow, you are such an incredible knitter! Those 60 hours of knitting probably didn't seem like fun but, man, what beautiful results-in the blanket and in the relationship with Guy!